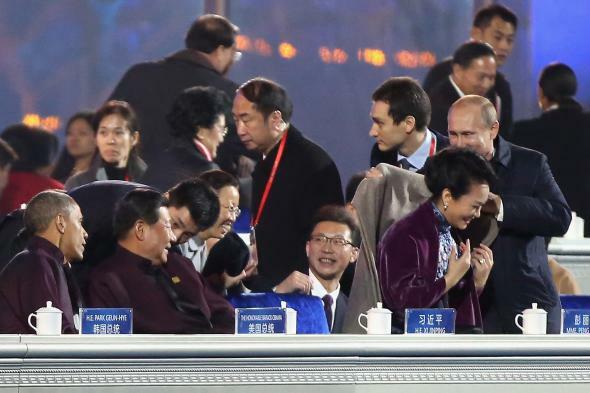 Putin’s flirting with China’s First Lady at APEC gets censored. Global economic summits aren’t particularly racy affairs. The scandals are usually confined to interest rates and trade barriers. As such, TMZ doesn’t usually send a camera crew. But this year’s annual Asia-Pacific Economic Cooperation (APEC) meeting kicked off in Beijing on Monday with an unusual shot of titillating diplomacy—courtesy of none other than Vladimir Putin. While Xi was distracted talking to U.S. President Barack Obama, who was sitting on his right, Russia’s tiger-shooting, horseback-riding president made his move. After a brief exchange—you can almost imagine Peng making appropriately cliché small talk like “my, isn’t it chilly in here”—Putin abruptly stood up, grasped a tan coat in both hands, and wrapped it chivalrously around the first lady’s shoulders. She smiled gracefully, thanked him, and sat down—only to surreptitiously slip the coat from her shoulders moments later into the waiting arms of an attendant. Was the move friendly or flirty? We’ll have to wait for the official transcript of Putin’s internal monologue before we have a definitive answer. The gesture could very easily have gone unnoticed amidst the economic hubbub. But tabloid hubbub consumes all other types of hubbub, and when Chinese news sites began posting video of the interaction, which was caught on camera by Chinese state broadcaster CCTV, it started to make the rounds on Chinese social media. The G-rated tabloid story likely would have died there until the Chinese censors, fearing it’s not exactly clear what, obliterated any chance of that happening. “Within hours of posting the video, Chinese news sites had already pulled it off their sites, and censors scrubbed it from social media sites,” according to FP. Here’s the video of the geopolitical drama. You can judge Putin’s intentions for yourself.